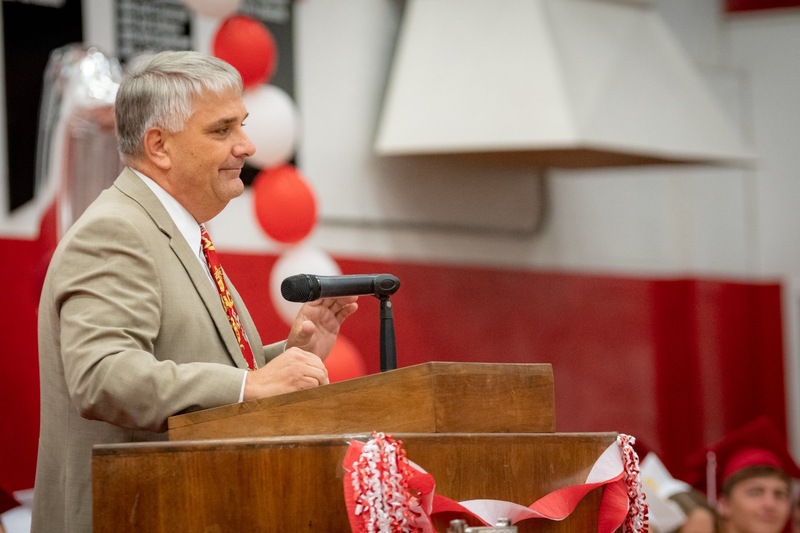 Tim Sweeney, Coquille School District Superintendent since 2010, has been named the 2019 Oregon Superintendent of the Year by the Oregon Association of School Executives (OASE) and the Confederation of Oregon School Administrators (COSA). This award automatically places Sweeney in the running for the National Superintendent of the Year Award from the American Association of School Administrators (AASA), sponsored by First Student, VALIC, and AASA. Sweeney’s selection as Oregon Superintendent of the Year will be formally announced at the Oregon School Boards Association Annual Conference in Portland, November 8-11. In more than thirty years as an educator, Tim Sweeney has been a substitute teacher and high school soccer and basketball coach in Medford, a Social Studies teacher and eventually Athletic Director at Eagle Point Junior High School, and a principal and superintendent in the Butte Falls School District before beginning in Coquille. Now, as superintendent in one of Oregon’s lowest socio-economic counties, Sweeney has been faced with the challenge of providing a quality education with extremely limited resources. Under his leadership, Coquille students now have a comprehensive alternative school for grades K-12, an early learning center Sweeney personally oversaw to meet the needs of 30-month to six-year-old students, classes in Adaptive Life Skills for K-12, and reduced class sizes from ranging in the 30’s to the 20’s. "When Tim comes up with an idea I never question IF we will implement, only WHEN we will implement (and it will always be sooner than I think is possible). It is my pride and pleasure to work for Tim,” said Teri Pointer, Coquille School District Business Manager. With a hands-on work ethic, Sweeney is not only attentive to staff with an open-door policy, he is also an involved member of the community and was awarded Citizen of the Year by the Coquille Chamber of commerce in 2012. His colleagues and staff admire his resolute philosophy to always improve conditions for the students and families he serves. "Tim Sweeney doesn't understand nor accept complacency,” said Jeff Philley, Principal at Coquille Junior/Senior High School. “Every class, program and staff member will be better tomorrow than today. He will have great reservations about receiving this award if it means we will stop for a minute to catch our breath." Sweeney’s dedication to improvement has resulted in a graduation rate that rose from 70% in 2009 to 90% in 2016; 50% of those graduating seniors in 2016 had also taken at least one college class prior to graduating. Additionally, the percentage of ELL students in the district meeting AMAO requirements has increased from 17% to 77%. Though resources may have seemed limited, Sweeney has never allowed it to limit potential for his students. Coquille has recently added eight new school busses configured with Wi-Fi to provide safe travel for students, as well as a state of the art daycare center to provide families in the community with safe and advanced care for their children. In his nomination of Sweeney, Coquille School District Special Programs Director, Wayne Gallagher, underscored Sweeney’s commitment to excellence when it comes to meeting the needs of Coquille families and students. Sweeney will be honored at the 2018 Oregon School Boards Association Convention November 8-11; at the 2019 OASE Winter Conference in Gleneden Beach in January; at the 2019 AASA National Conference in Los Angeles, CA, in February; and at the 2019 COSA Annual Conference in Seaside in June.